T, The New York Times Style Magazine, incites a bizarre, unslakable lust for an unknown stratosphere of luxury, at least for a couple of minutes. I try to use the content as inspiration rather than being only frustrated with the crazy prices. Sometimes I even succeed. 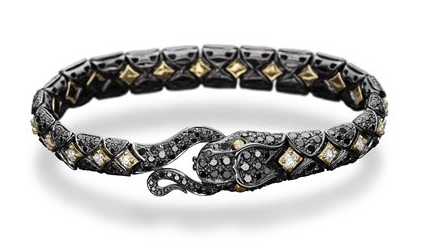 The "Time Traveler's Wardrobe" features the essentials in a jet-setter's weekend carry-on, but even my 1%er girlfriend Iris would think hard before dropping $23,000 on a Paul Morelli diamondback bracelet, stunning though it is. 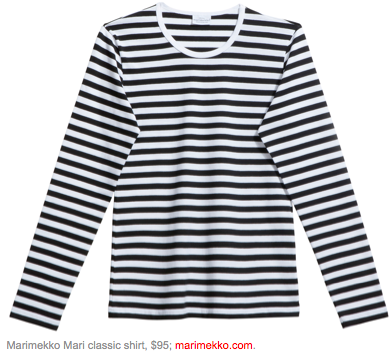 The striped tee by Marimekko, $95: not as dizzingly pricey, but is the revered Finnish brand the only option for an ubiquitous style? That top is worn with legging ankle jeans, price $168. The woman is not spending her dividends on meals, that's for sure. 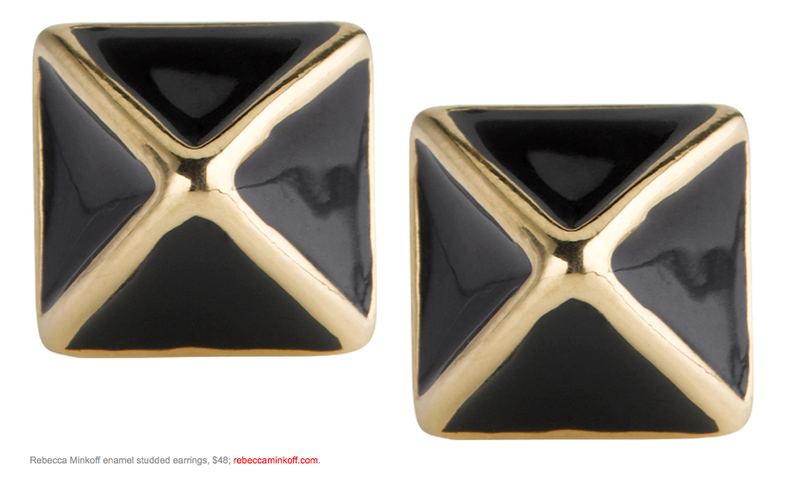 Rebecca Minkoff enamel earrings are my taste, crisp and versatile–and at $46 feel practically given away. 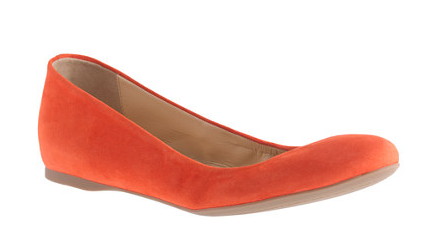 Tod's are indeed luscious shoes; the tasseled coral flat exemplifies their offhandedly ritzy vibe. Price, $445. 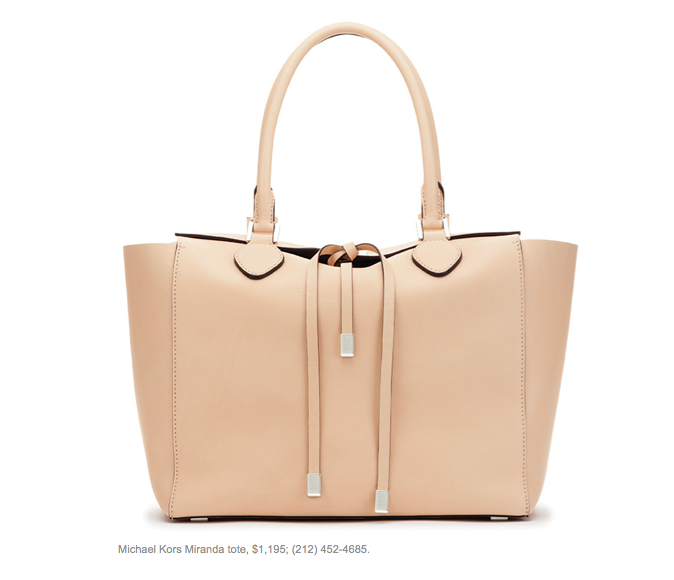 The bag is Michael Kor's serene Miranda tote; price, $1,195. While washing my windows, jets roaring overhead every few minutes, I thought about how I'd afford-ify this look to ride a city bus, and pondered, Are there some things you just can't find in a less costly version? 1. 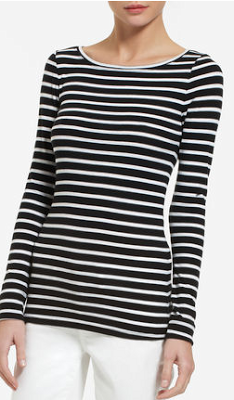 A striped tee from your favourite department store. This one is BCBG, on sale for $45 and I've seen decent ones for much less. 2. 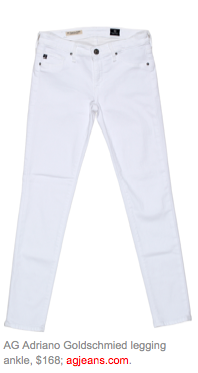 White jeans: You know where to get them; on sale by the end of the month; a mid-range pair might be $50-$60. Why pay $168 to squash the inevitable blob of blueberry on them? 3. The shoe: tart pomegranate ballet flats $145 at J. Crew. You can find cheap ballet flats but, if you love your feet, you're looking for a better-made model. 4. Now the hard part, that bracelet. The Morelli piece is just not knocked off successfully, so let's rock the resin. Alex Bittar's Durban Gunmetal Salamander bracelet has charisma too; there's something about salamanders and summer. But you could enjoy it in deep winter also, which means the price, $225, is less of a bite. Still too steep? 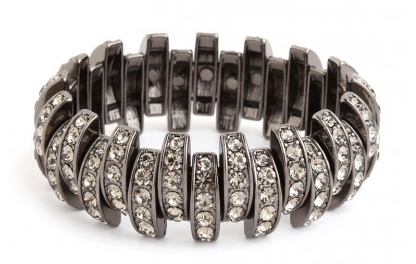 Some of you are fearless with the costume, and you I'm sending to the online trove Bauble Bar, where $30 gets you a hematite Zigzag Bangle. 6. The bag: another tricky item to substitute. Like a broken heart, a subpar bag seems to follow you around way longer than you ever wanted. I wouldn't expect to find the Miranda's fine Vachetta leather in a low-cost bag; I'd scout for another pale, summery material, raffia or straw with rich leather trim, like this vintage woven leather market tote, on Etsy for about $45 from GirlLeastLikely (last time I looked). 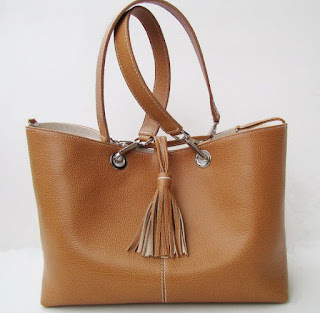 If you prefer leather, the Italian leather tote from Etsy seller farragobags2 is handmade from supple vegetable-tanned caramel leather (and available in other colours) for an eighth of the Miranda's tag, $150. That particular T feature appealed to me more than their spreads of ballgowns or outré outfits; it's a look I relate to (minus the toothpick jeans)... but not at that price. Iris can buy those high-end items and still donate generously to causes, but most women are in my shoes, with saving and giving top of the list, and very few jet-set purchases in the equation. Do you adapt luxe looks to your budget? How do you do it? Not luxe by the NYTimes standards, I know, but I'm thrilled, still, by my Hermès double-tour watch & strap -- inspired by your posts, in case you don't know. That and my M0851 bag, whose logo is very discreet but whose leather is yummy enough to please me and whose clean, well-thought-out styling say that I'm not chasing the trends but am sure enough in my taste to invest a bit (a modest investment, to be sure, by Birkin standards, but still a budget-juggle for me). I love having these few items that get used every single day and still please me. Oh, and my Wendy B gold fleur-de-lys necklace. I justify Hermes scarves with classic shirt and pants as wardrobe extenders without the space in the closet. i buy a few luxe things and mix them with classic pieces that are much more wallet friendly. i will need to keep control on my spending as I will be on a fixed pension in a month! I have a leather purse (cost $300--no bargain, but not designer price) that is often mistaken for a much more expensive bag by a well known name. I didn't even realize the similarities when I purchased it. I just saw good design, a good size, and pretty leather. I really like the earrings in this post (the pair in the NY Times article) and yes, they seem like a steal. I often wear a pair of plain round onyx earrings purchased about 15 years ago, but this pair has a bit of gold and that would be a nice change. Loved this post, and your clever substitutions! My secrets are thrift stores, and Vogue Patterns! But my style is less polished and more arty than these jet-setters; I've never lived where I had to dress to impress, even when going to business meetings: that's one budget-friendly (and sometimes boring) virtue of having spent most of my career in Vermont. For much of my life, I made my own clothes for special occasions; now I often find great individual items on Etsy, too. I'm totally with you on 'get the look for less'. I'd like to hope that even if I was rolling in filthy lucre, I'd do more useful things with my money than spend it on stuff for myself. I shop at outlet centres for designer items (i.e. recently got a lovely leather handbag by a nice brand in a summery colour for 75% off) and on sale. I try to judge everything I buy carefully for quality i.e. well cut, non-crease, thick enough fabric, attractive flattering colours and patterns. 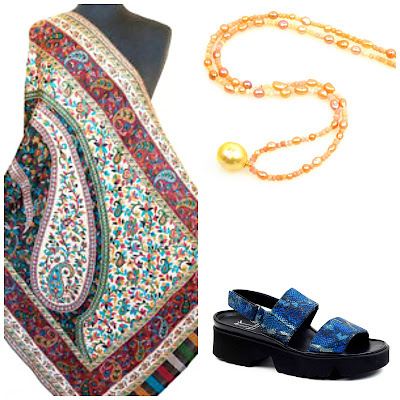 You can sometimes get some lovely things from the cheapest shops if you look. I try to buy on sale. My good fortune is that my sister and I are the same size - and even over 65 - we share "fancy" clothes. And outer wear. Living in LA - we don't all need a heavy coat! Also my mom, my sister and my daughter all live in close proximity so we all share the family "jewels." I buy Calvin Klein tees, all sleeve styles, for $4.50 each. They are soft, smooth cotton in subtle shades and neutrals, beautifully finished at the neck. That's for basics. I mix really distinctive pieces of family jewelry with simple, newer pieces, like a sterling bangle or ethnic beads. I buy really fun socks in great colors and patterns for a little shock value. And I re-tailor my older, still good, jackets and coats. Good post! I make most if not all of my clothes and I make my own bags (not leather but some are designer inspired). I buy fabric that is of high quality and select patterns that flatter me. I live in Alaska where designer doesn't mean a lot. Jewelry I leave to my husband to buy for Christmas. I have some very nice ivory, silver, & gold pieces; Alaska Native design/made. Some of these pieces are done by master carvers (museum quality). Yes, I wear all of my jewelry, wearing what pleases me. I love your posts...truly thought-provoking. I buy my bags at Canadian retailer Danier Leather....a similar style to the Michael Kors is only $129 on sale. Silk hand-rolled scarves...my favorite supply is "The Hospice Shoppe", a charitable store supporting Hospice; but have also found some nice ones at Value Village. I make my own jewellery, but have also collected vintage for years. If you look around, and look outside the box, it is possible to live large on less. This is the kind of posting I like . I really feel that if you have a 'good eye' you don't need limitless funds . You only have to see some of these 'celebrities' to realise that money isn't the most important thing . For me quality of fabric matters , I have to touch everything when I look round ,which makes my husband laugh . Other than that , the cut & fit for my shape is important , so I rarely buy on line . Handbags are my weakness but I hate them to be identifiable , I like a little mystery about them . mater: I respectfully will counter your opinion; anything from Hermès would qualify as luxury. Anon@11:02: Now that is a rationale I'm stealing! hostess: Yes, retirement does change how one spends, and certainly (for me, anyway) in quantity as not needing work clothes makes a big difference. Susan: Earrings are prime territory for budget jewelry as the wear is gentle, so you can get away with gold plating or other lower-cost finishes more effectively than say a ring. Beth: Thanks for reminding us about Etsy. I had quite a long sewing career but after producing several wadders, quit. May be time to go back. birdybegins: I have a few friends who look like Vogue shoots on outlet shopping only. I would love to accompany you and learn the deep skills. Swissy: You've got this down! And you have a good tailor. AnnetteAK: Sometimes someone comments and I think, if only I could see that. This is the case reading about your Alaskan jewelry! Lm: You, and several other commenters, are showing us how to be resourceful. I find Danier's quality a bit uneven but they usually have a couple of standout things each season and really good sales. They seem to finally be designing more minimal, clean bags- yes! Wendy: I call that 'petting the clothes' and do it too. Why not? After all, you are living inside the thing. It's easy (if one has the means or is willing to carry debt) to throw money at clothes but that's not how I and most in the Passage want to live. Wendy; Me too- and I'd enjoy hearing what bags you choose without those logos or identifiable features. 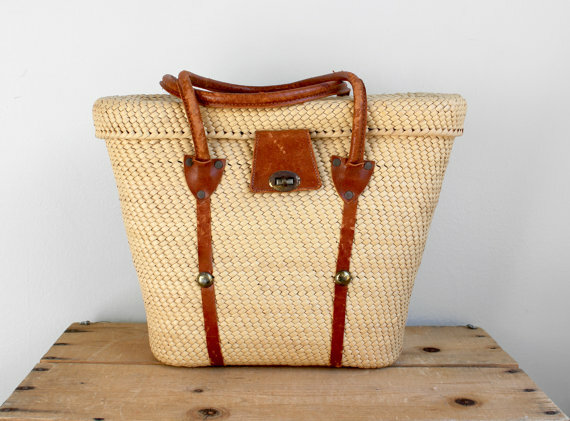 I have found bags in small shops on holiday in France , Spain & Italy , no major makers & a couple are 40s/50s second hand . All clean & tidy. I do like il bisonte too & my favorite Ally Capallino - doesn't sound English but she is . There is a website but it can't show the lovely quality of the leather , which improves with time & is worth the cost . Just no bling or showy logos for me . I'm curious: where did this term "the Passage" come from? I read a lot but honestly I had never heard it before coming here! Wendy: Thank you, what a wonderful adventure while traveling! 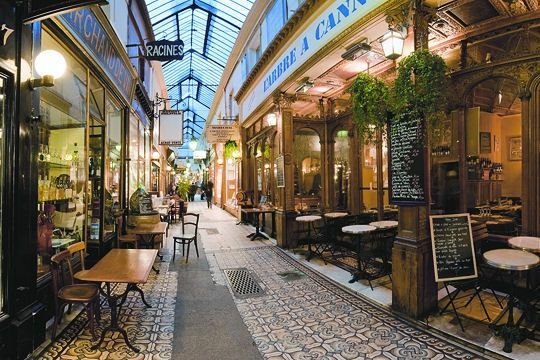 Beth: The "Passage" part comes from the passages of Paris, so beloved by flaneurs, arcades filled with tiny shops ranging from treasures to tat. A second meaning is the life passage from adult to elder. I found women over 50 under-represented (or told to stay forever young) and wanted to write about the post-50 years differently. 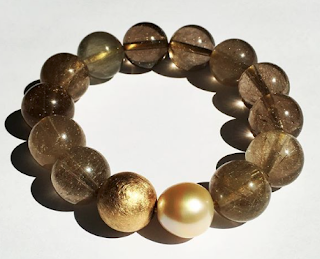 And the Perles part is because I love pearls, especially unusual varieties. The bracelet strategy is genius. I think that outfit, inexpensive striped tee, white jeans, colored bag and a bracelet like that would be great. LPC: I like that it's simple, but each woman would bring her own approach. Wendy: Capellino bags, dreamy; at a discount, heaven.